Revealed online earlier this month (and available to order immediately), the new 720s Spider combines the thrill of open-air driving with unparalleled Super Series dynamic performance and sophistication. McLaren’s engineering ingenuity, underpinned by the inherent strength and rigidity of carbon fibre, means that despite the removal of the fixed roof there is no need for additional strengthening; even the unusually slim but incredibly strong windscreen A-pillars first seen on the 720S Coupé remain. To provide enhanced rollover protection for occupants, fixed carbon fibre structural supports are integrated into the rear of the Monocage II-S, additionally providing the main anchor points for the roof system and the seatbelts. 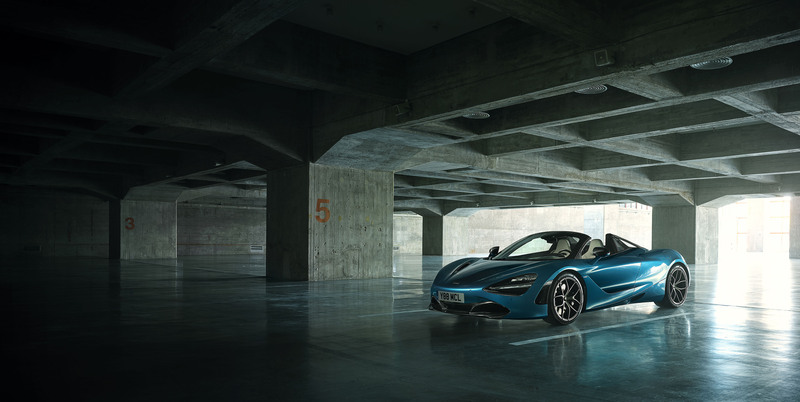 In the first-generation Super Series, steel supports featured and the switch to carbon fibre has contributed to the Rollover Protection Structure (ROPS) in the 720S Spider being 15lbs lighter than in the 650S. Overall, the new 720S Spider is just 108lbs – or less than 4% – heavier than the 720S Coupé. The increased weight is primarily associated with the RHT and tonneau system. 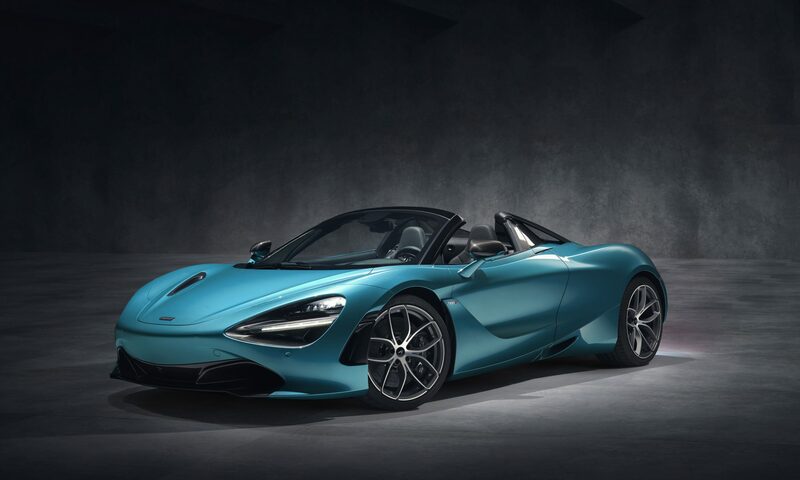 With a lightest dry weight of 2,937lbs, the 720S Spider is comfortably the lightest car in its competitive set, at 194lbs less than the 3,131lbs dry weight of its closest rival. The low weight is the foundation for the dynamic, performance and efficiency benefits that McLaren is so adept at exploiting for the greater enjoyment of its customers. The canopy-like design of the 720S Coupé is recognized for the sense of 360-degree vision it provides, allowing light to flood into the cabin and setting a new benchmark for visibility. This philosophy of unrivalled vision is central to the second-generation Super Series and the new Spider moves the game on again, with unique, glazed flying buttresses further aiding driver visibility as well as adding visual drama to the car. The leading edge of the buttress features an aerodynamic carrier to guide airflow, before dramatically tapering off to expose darkened glazing; the design and the use of glass delivers a 12% improvement in over-the-shoulder visibility compared to the previous McLaren Super Series Spider. Acceleration is nothing short of phenomenal, with 0-60mph covered in 2.8 seconds and 0-124mph achieved in just 7.9 seconds – just 0.1 seconds off the pace of the Coupé. The standing quarter mile sprint is dispatched in 10.4 seconds – again, only 0.1 seconds slower than the Coupé – and where conditions allow, the 720S Spider will continue accelerating to a Coupé-matching top speed of 212mph with the roof raised. Even with the roof lowered, maximum speed remains extraordinary at 202mph. The minor variations in performance arise from differing aerodynamics and the additional 108lbs the Spider carries. The Retractable Hard Top (RHT) of the 720S Spider is a completely new design, with a one-piece, carbon fibre roof panel as standard. The hardtop maintains the distinctive silhouette and aerodynamic purity of the 720S Coupé and provides a full carbon fibre upper structure when the roof is closed. The folding mechanism for McLaren’s new RHT is electrically rather than hydraulically driven and the system is the fastest-operating convertible roof in the supercar class, with the retractable hard top lowered or raised in just 11 seconds – six seconds quicker than the 650S Spider. The combination of e-motors and the strength and light weight of the carbon fibre RHT enables a maximum vehicle speed during operation of 31mph – a significant increase from the 18.5mph of the 650S. With these performance statistics, it is no surprise that McLaren has registered three worldwide patents for the roof system. The active rear spoiler, which automatically activates to either decrease drag or increase downforce and can also act as an airbrake to enhance vehicle balance under heavy braking, can rise at lower speeds and to a higher position overall in the Spider application, optimizing downforce and balance to ensure that performance and driver engagement is on par with the 720S Coupé. And while the rear spoiler is identical on both Coupé and Spider, the deployment mapping is bespoke to each body style, the aero settings differing depending on whether the Retractable Hard Top is raised or lowered and the vehicle electronics being automatically aware of which condition it is in. The new 720S Spider is available in the same three specifications as the Coupé, with Performance and Luxury trims extending above the standard model. Two new exterior colors – Belize Blue and Aztec Gold – have been introduced for the new Spider among a palette of 23, one of which is Supernova Silver, a Heritage color that was first available on the McLaren 12C. The McLaren 720S has established a reputation in Coupé guise for its ground-breaking design, cutting-edge technologies and ferocious pace, complemented by a breadth of ability and sophistication that delivers everyday usability belying its extreme performance status. Available for order now. Contact McLaren Dallas for details.